Dear Paul, Gaynor and the rest of your team. They say 'what a difference a day makes !' But in my case what a difference a fantastic new mattress makes for the best nights sleep in years. 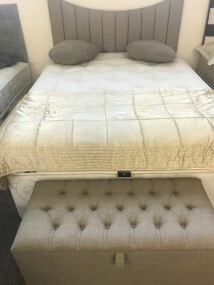 Thank you the Hamilton family for an amazing customer service, a mattress bespoke for my own special comfort, the old mattress taken away and lot's of happy chat and sliley faces - all at an unbeatable price. Give yourselves a big pat on the back for your obvious pride in your products and truly wonderful customer care. I am writing just to say a big THANK YOU for all the comfort you have given us with our new beds. It seems hard to believe that mattresses can make such a difference ! Thank you once again - I will be recommending you to 'anyone' who wants to buy a bed. As promised (if successful) a token of thanks for 2 months of undisturbed sleep! Since my car crash over 2 years ago I hadn't had a good nights sleep. Now with the bed you made me I can sleep in total comfort. Thank you Paul for the bed you made us. We have never had a bed so comfortable and would not hesitate in recommending you to anybody.